In a world of modern graphics and one track story paths, Octopath Traveler is unique. With its premise of telling eight different stories in one world, Octopath Traveler gives you the opportunity to choose the order and flow of how you want to play through its interesting seperate stories, with the choice of playing as many as you want at a time offering a custom gameplay experience. While having to level up your characters each time you want to try a new one from its eight can make the experience run a little long, it makes each experience feel like a journey of its own in this world harboring its own lore that leaves a connecting thread to each story if you play them all, but also has each one stand well enough on its own. 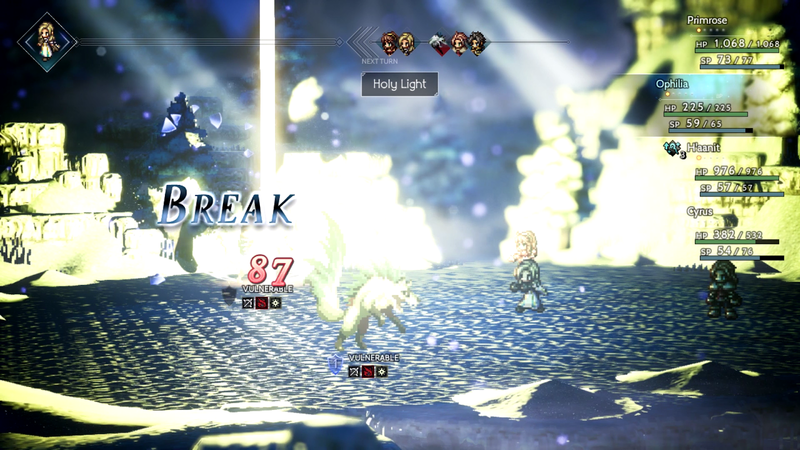 All of its unique storytelling partnered with a great battle system that makes finding and exploiting weaknesses a rewarding process and its class actions that make each character useful in different ways make Octopath Traveler a satisfying JRPG with no shortage of things to do and a great world to play in. Octopath Traveler’s story begins with choosing a character from its eight, a choice that will influence the starting tone of your personal playthrough. There is a big variety of characters to choose from - from your typical JRPG Warrior and Cleric types to unique ones like Merchants and Apothecaries, the starting choice influences your introduction to Octopath Traveler’s world. I started my journey with the Dancer Primrose and had my journey start with her darker story and motives, but the main story flow is, on a base level, the same no matter who you choose, with an introduction, conflict and boss battle conclusion being a common thread in all of Octopath Traveler’s chapters that works in keeping each one interesting and moving. While the choice doesn’t have much impact into the rest of the Octopath Traveler journey, it does serve as a good introduction to how you can play however you choose, as this is the first choice of how you want to play out of many more along the way. These choices are necessary as it’s not exactly easy to go through one character at a time as I had expected to. 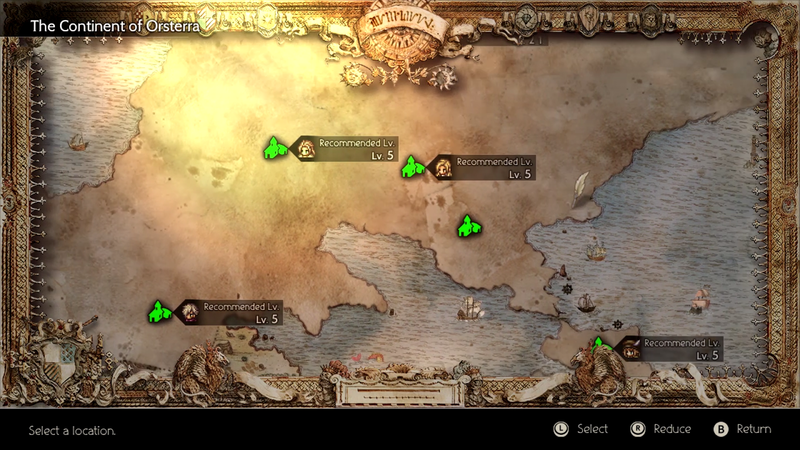 With Primrose’s second chapter having a level requirement of 21 on the map after I finished her first chapter at level 4, I quickly realised that playing through one story at a time wasn’t the best way to go for me unless I wanted to solo grind a lot, so in a way Octopath Traveler encourages making your own journey by playing in whatever order you like, whether it’s full of more grinding or story. All the characters stories are available to access anytime on the map and to have a full party, it’s necessary to play a few. It’s with this I came to appreciate the stories of other characters - I expected my journey to be full of Primrose and her path of revenge, but very different characters like the caring Apothecary Alfyn and the curious Merchant Tressa were characters I came to know and love that I had little interest in when I started. Although for me it seemed like a necessity to get other party members, it never felt like a chore to play through their chapters and while some stories are naturally better than others at different points in each one, all the characters growth in their journeys in each one were interesting to get to know overall. In saying that, the thing I like most about Octopath Traveler is the fact that you don’t have to play all the stories. I ended up getting all the character endings for my review and had a lot of fun doing it, but you can definitely play this game as little and as much as you like and still feel a sense of accomplishment. Because each story is an individual story and the other characters don’t link into each one, it’s more about completing individual stories rather than all of them. There are little common threads in a few of the story that link the stories to the world that are cool if you play multiple or all of them, as well as quests that lead to a true final boss battle, but they’re mostly just bonuses for those who choose to do all of it. I felt accomplished when I finished Primrose’s story and saw the end credits roll and I also felt accomplished when I finished the last of the eight stories and I like that Octopath Traveler leaves everything on your map so you can come back to it at anytime when you want to try another one of its stories. 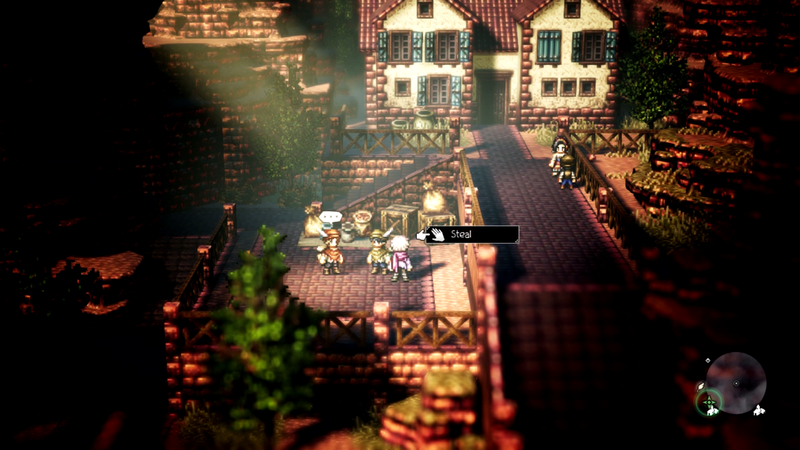 While Octopath Traveler allows you to play the stories in any order, there are a few things that might influence your decision of which order you play in, such as character jobs and path actions. Each character has a class that corresponds with their character for use in battle, with classes like Warrior being your typical physically strong class and Cleric being your healer, but then there are other classes like Merchant that allow you to spend your in-game money to summon the right thing you need at the time or Hunter that allows you to summon beasts you’ve captured. All of these classes have their own different useable weapons and attack types that become essential to balance well when trying to take advantage of the Break mechanic which allows you to gradually cut down enemy shields to leave them defenseless for one turn in battle where you can pile on attacks, so it was enjoyable trying to strategically balance which characters were best against a certain boss both weapon and attack-wise, along with the characters I liked. Also in battles is the boost mechanic that allows you to choose whether to do a stronger attack or save the boost point for later and also findable secondary classes that make battling with a party of whoever you like much more balanced. All these things together make Octopath Traveler’s battle system a joy to play and is one of my favourite turn-based systems in recent times thanks to its balance of strategy and decision-making. Outside of battle, your party affects which Path Actions you can use while exploring the big world of Osterra and can be incredibly useful for story moments, quests and gathering rare items to aid you on your journey. There are a few different actions to use, with some allowing you to challenge villagers to a fight and others let you have someone follow you and aid in battle. A cool part of these is the Rogue and Noble Paths that change these actions depending on a character’s personality. For example, the Thief Therion can Steal items, whereas the Merchant Tressa buys them instead, which not only suits their characters better but also offers a choice: take the time to level up Therion more to get things for free or buy them for currency that is not always easy to come across. I like how these actions make Octopath Traveler’s party building more than just about battle and while some actions and party members are more useful than others, the battle and path actions made the choice of who to use much more engaging than just picking your favourites. A notable aspect of Octopath Traveler is its presentation, with its nostalgic retro aesthetic mixed with modern effects and elements giving it a look of its own. 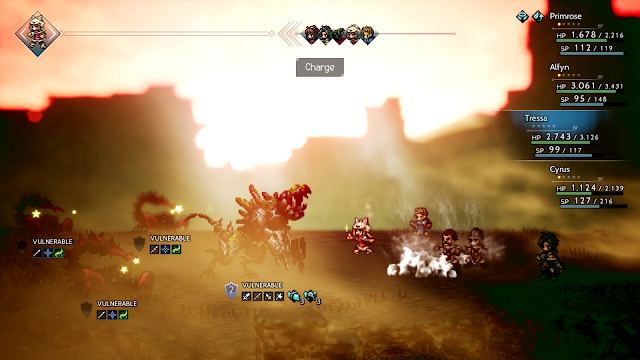 The sprites running across lovely, pixelated kingdoms contrasted with gorgeous, flowing, real-looking water and deserts and caves with dirt that shimmers and glitters gives Octopath Traveler a real beauty that pops off the screen. 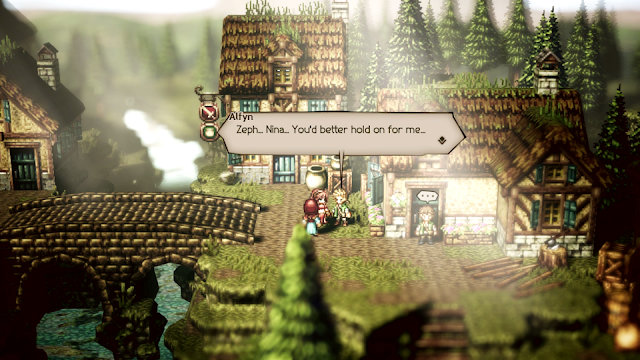 These beautiful visuals partnered with a big soundtrack with stunningly orchestrated battle tracks and boss themes, and voice acting that expressed character’s emotions well make Octopath Traveler really live up to its 2D-HD idea and I would happily play another game in this aesthetic again even though I generally prefer games with a more modern visual style. My over 70 hour playthrough of Octopath Traveler’s eight stories was full of lots of big boss battles, interesting stories and getting to know each Traveler and I’ve definitely left the experience feeling mostly positive. There was one small wish I had after completing my main party’s stories though and that was that your reserve characters also leveled up while they’re not in your party, or at least had the option to. Perhaps this is because I played Octopath Traveler’s eight stories all in one go, but after feeling the satisfaction of finishing my four main party member’s stories, it felt strange to go back to the other four I hadn’t used much and have to really level them up to be strong enough to face some of the challenges and Path Action events in their stories. I’m guessing they probably don’t level up in order to emphasize the separate feeling of the stories and characters, but if you’re like me and leave half your characters on low levels until you come back to them 50 hours later, there may be some extra grind sessions that may pad out the experience more than expected. But in saying that, there were so many fun boss battles with every character along the way and in bonus caves and areas that I didn’t mind so much. In fact, with many quests and secret jobs and areas to find, there’s probably a whole other playthrough worth of content that I can go back and do and the custom nature of Octopath Traveler means I can do it at any time. I love that thanks to having so many different ways to play, I can go back and do these things now, but I also had the option of doing them during any of the stories and whether I want to get more secondary jobs or do more quests will be the next choice I make in how I want to play. Octopath Traveler stands out against other modern day JRPGs with its take on a retro-aesthetic and storytelling, and really succeeds in giving each player a custom journey. The ability to play one story or any of its eight gave a real sense of freedom in choosing how I wanted to play in its world and I love how this is reflected in its battle system, its quests and world overall. While I’m sure doing the big task of finishing all eight of its stories won’t be for everyone, I think it’s really great that you can decide whether or not to do so at anytime in one playthrough and with a stunning world, I know I want to come back to it someday. 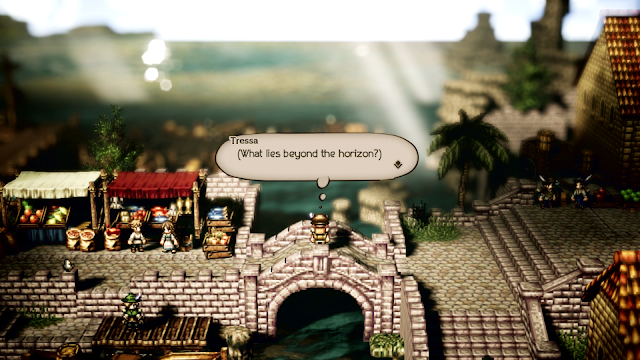 Octopath Traveler might not be for everyone with the way it tells stories, but if you like the idea of having many journeys in one world, I’d absolutely recommend trying this unique, retro-inspired world for the way it does things differently. Keen to go back and get all the jobs and spend another 70+ hours! You can pick up Octopath Traveler on Amazon! Did you pick up Octopath Traveler? If you did, what did you think of it? Great review! I'm just finishing up my last of the 8 characters as we speak!